THE MATERIALS ON THIS WEB SITE ARE PROVIDED FOR INFORMATIONAL PURPOSES ONLY, DO NOT CONSTITUTE LEGAL ADVICE, do not necessarily reflect the opinions of Diefer Law Group, P.C. or any of its attorneys or clients, and are not guaranteed to be correct, complete, or up-to-date. 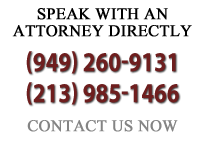 THIS WEB SITE IS NOT INTENDED TO CREATE AN ATTORNEY-CLIENT RELATIONSHIP BETWEEN YOU AND DIEFER LAW GROUP, P.C. AND YOU SHOULD NOT ACT OR RELY ON ANY INFORMATION IN THIS WEB SITE WITHOUT SEEKING THE ADVICE OF AN ATTORNEY. Please note that no attorney-client relationship is created with Diefer Law Group, P.C. or any of its attorneys absent an EXPRESS WRITTEN AGREEMENT between the firm and the client. The mere receipt by the firm of an email does not create an attorney-client relationship. Please also note that the Statute of Limitations (the deadline imposed by law within which you may bring a lawsuit) may severely limit the time remaining for you to file any potential claims you may have. To the extent this web site contains information indicating results that either we have achieved for our clients, or results of other cases as posted by the Los Angeles Daily Journal, these past results do not guarantee future results. More specifically, the results shown in the section entitled “Recent Verdicts and Settlements” represent cases as reported in the Los Angeles Daily Journal and do not reflect outcomes obtained by Diefer Law Group, P.C. nor do they represent a guarantee of future results .